Offering you a complete choice of products which include swiss screw machined parts. 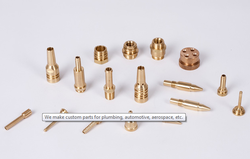 RMS Group are a medium to high volume Screw Machine Parts & Components supplier who produce Brass Turned Parts, Brass precision Turning components to specific drawing tolerances. Due to sound engineering and innovative flair, we can solve manufacturing requirements of the most technically demanding parts. In addition, our Inspection Department has a comprehensive stock of gauges, clocks and micrometers etc, in many instances we work closely with our customers during the design stage of their product, to ensure that the most economical component is produced with respect to shape & standard material etc. Quality is not just about having procedures in place. It is also about having the right tools to do the work, and that our staffs are quality conscious. This comes about by having a pride in what they produce.